Cocker Spaniel- Bred to hunt. Happy, smart and gentle. This Personalized Dog Christmas Stocking is a special gift that includes your dog in Christmas celebrations. Your dog has been good all year and this is the perfect stocking, about 19 inches long, to hold all their holiday treats. 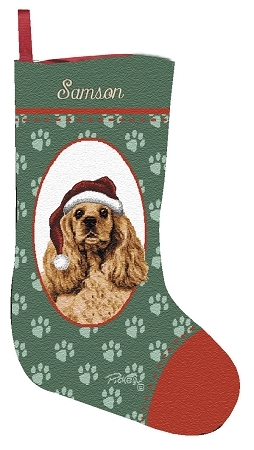 Your dog's stocking will look great over the fireplace and will become a keepsake to cherish. Comes personalized with your dog's name up to 12 characters. A great gift for dog lovers! Availability: Personalized Christmas Stockings take approximately 2 weeks to personalize and ship plus transit time. Please note: personalized gifts are not returnable.